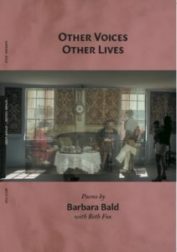 Barbara Bald’s first collection of poetry, Drive-Through Window, is an invitation into the stories of personal relations the author has carved into verse. Her poems draw the reader’s attention to her keen sense of people. Her gift as a poet is to take a scene, a photograph, or personality and allow the reader to walk with her, to discover the story’s unfolding and ending together. Her poetry is brutally honest. In the poem “Illusions”, Barbara paints a portrait of an elderly woman named Betty. Betty is a survivor. She’s full of zest, keeps her life moving by making plans for senior trips, plays bingo, and belongs to many social clubs. She maintains a fine wardrobe, and keeps her house in order. Midway through the poem, Barbara turns back the clock and describes Betty’s life as a young girl. Betty develops survivorship skills early on under the shadow of a heavy-handed father. She learns to defend herself as described in these lines, “In her pocket you would find a pearl-topped hat-pin/ she could wield against unsolicited hands/ that might wander at the cinema.” There is an undercurrent in the poem that Barbara does not reveal, but only in the telling of Betty’s story. While Betty expends most of her life’s energy in survivor mode, a question remains, has she ever loved? The collection of poems in Drive-Through Window is organized in seven sections that include the themes: Upon Consideration, Voices of Aging, Regret, From the Nursing Home, Letting Go, Unexpected Insights, and Growing Wiser. In “Mirror, Mirror”, Barbara reflects on her own life. She worries if her earlier hopes have been lost to history. Do unexpected joys counter the emptiness of dashed dreams? In the last few lines, she shares the same concerns, not as an adult, but as a young girl looking into the mirror through older eyes. Drive-Through Window is an emotional ride. It offers the reader hours of insight, of surprise, joy, and heartache. Without asking, Barbara’s prompts the reader to do a bit of his or her own self-searching and self-reflection. She presents her poems with grace, honesty, humor, and in doing so, affirms the poetry in all of us. Drive-Through Window, Poems by Barbara Bald (2nd edition, published by the poet in New Hampshire, 2012, printed in Portland, ME) 119 pages, paper. ISBN 978-0-9789345-2-9. $17.95 plus $# shipping. Barbara Bald’s narrative poems in Drive-Through Window are formed with fine skill for observation and illustration. Each one tells its story through concrete images of action and reaction—ideal examples of advice often given to writers to “show, don’t tell.” She takes a reader through days of her life with experiences that will draw out memories from many readers. The poems are written by an older person—her age evident even without illustrative photos that place Bald’s stories in recent history. Although Bald’s poetic attitude comes across as positive, sometimes even uplifting, her stories are heavy. Each of her poems either ends with or wraps around some loss or sadness.The first poem sets a clear direction that includes great control of language and warning of what’s ahead. “On Turning Twelve” starts with a girl “Standing at the field’s edge…” moves gracefully into “… their white tails flash in sunlight” and ends with “bodies limp, just hours from our family stew.” I could not read more than two or three of the 80 plus poems without feeling dragged into the poet’s gloom, however cleverly she tucked it in. Many publications and teachers urge writers to sharpen poems with that edge of loss. Bald fits in well beside Maine’s current Poet Laureate Wes McNair with her skill at storytelling and digging into her own life for knowledge of disappointment. Much as I admire McNair, I also have to limit reading time in his books, especially before sleep. One of Bald’s upbeat poems, “The Adaptive Skier,” is full of positive action and good intention. Bald includes action and color—”Feeling the wind on her cheeks/she can anticipate the downhill rush.” I am supposed to find the great good in helping physically different people enjoy winter sport, but I find bittersweet in a poem that includes the watcher wiping away tears. Not that Bald comes across as hopeless. Her “Neverland” is full of whimsical images of a child’s pretending, running, and waving before she winds up under the weight of critical teachers and not being chosen for a softball team. Her “Cinderella” floats on childhood fantasy. Some readers may find poems set in a nursing home to be more realism than pessimism, but I find them hard to read. Perhaps Bald is writing too close to my own fears. She certainly elicits emotional response with almost every poem in the book, even when I don’t like that response. Chapter titles in Drive-Through Window indicate the book’s mood: Voices of Aging, Regret, From the Nursing Home, Letting Go. When she, in the final chapter, is “Growing Wiser,” Bald offers flowers, music and nature—all pointing into the decline of life. Bald’s biography lists her time at the Frost Place Poetry Festival and many excellent honors. Statements from prestigious poets support my conclusion that she is surely a gifted poet. Before I reviewed Drive-Through Window, another reader commented on the book being self-published—as if that would make more or less of any book. Most poets these days cannot find enough “real” publishers for their work; so they publish their own either through a print-on-demand or other company that makes money by printing books not bought by Beacon, Copper Canyon or another long-standing publisher. Walt Whitman self-published. So do many poets whose work Garrison Keillor reads on the radio. They make up creative names like Slippery Seaweed, Brightberry or Narramissic Notebook Press. Bald’s Drive-Through Window book cover and its photos are a delight. I hope she will publish many more poems before she reaches her own predicted end.